Pawsitopia offers dog walking Monday-Friday. We pick up your pooch, transport them to the doggie wanderland of the day, give them the time of their life and when they're nice and relaxed, we bring them home, towel or rinse them off, give them water and any enrichment they might need, and leave a happy and settled dog for you to come home to. We will also work on basic manners with your dog using positive reinforcement methods. Most of these walks will be off-leash. We walk rain or shine, unless there are extreme storms or extreme heat, which luckily, in our California climate, are few and far between! *All candidates for walkies must be up-to-date on DHPP and Rabies vaccines, spayed/neutered, licensed and currently on flea and tick prevention. 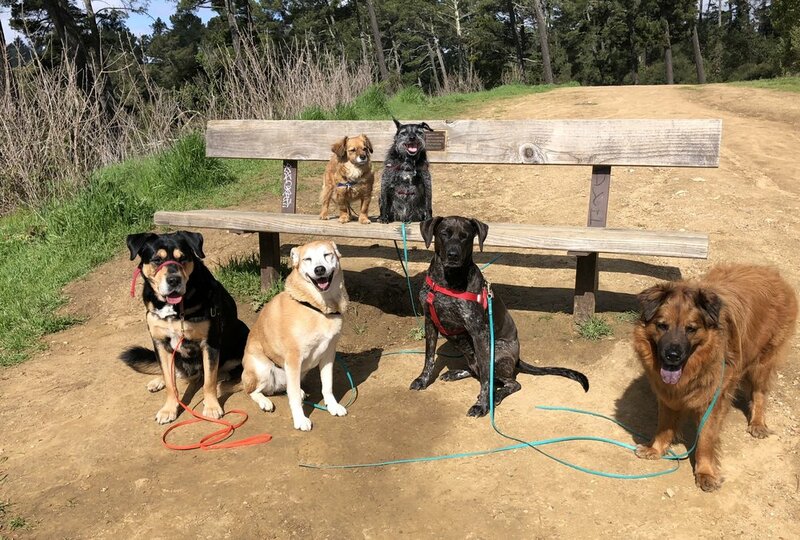 Our 1-hour group option, with pick-ups, drop-offs and transportation, usually has your dog out of the house for 2-3 hours at a time, with a guarantee of a 1-hour minimum walk. During this time, your dog will get a chance to socialize with canine cohorts, brush up on their basic manners and get out some much needed ya-yas! We will visit a variety of locations, such as: Redwood Regional Park, Leona Canyon, Sibley Volcanic Regional Preserve, Pt. Isabel, and Oyster Bay, as well as other East Bay Regional Park trails and neighborhood walks. We'll shake it up daily, so your dog gets to enjoy as many new experiences as possible, which helps prevent boredom and boosts social confidence. To keep your dog on a regular exercise and socialization routine, Pawsitopia requires our pups to walk a minimum of three days per week. We believe this keeps our group dynamic harmonious. *Solo walkies are subject to availability. Sometimes we all need a bit of solitude. Whether it's because our dog prefers a little bit of alone time, they are testy with other dogs or need a good one-on-one sports session with a tennis ball or Frisbee, Pawsitopia is here to give you and your four-legged friend exactly what is needed on their own terms.